An 1880s home in Delaware County had a 35-year-old low-boy furnace on the floor in the short basement. It had standing-pilot ignition, was rated 63% fuel efficiency, and had no room for an air conditioning coil. The blower was belt-driven, and the air filter did not have easy access. Scott Haring measured the old furnace, and mapped the supply air and return air ducts. 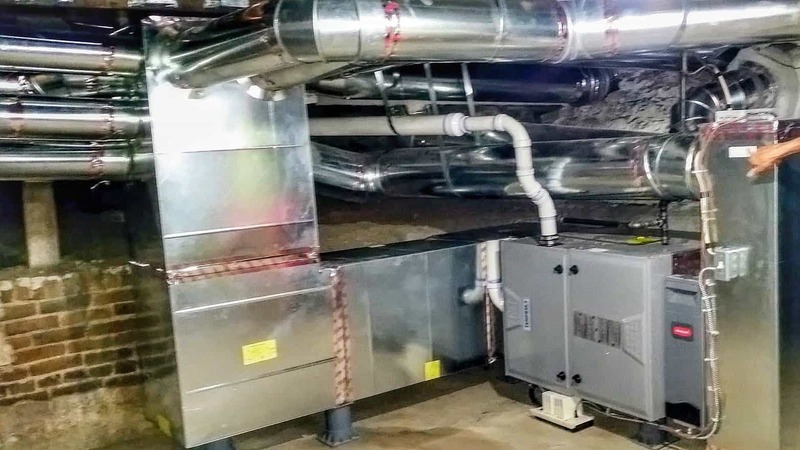 Field Supervisor Vic finalized the design for new insulated sheet metal ducts allowing a 96% efficiency Tempstar F9MVE furnace to be mounted horizontally. 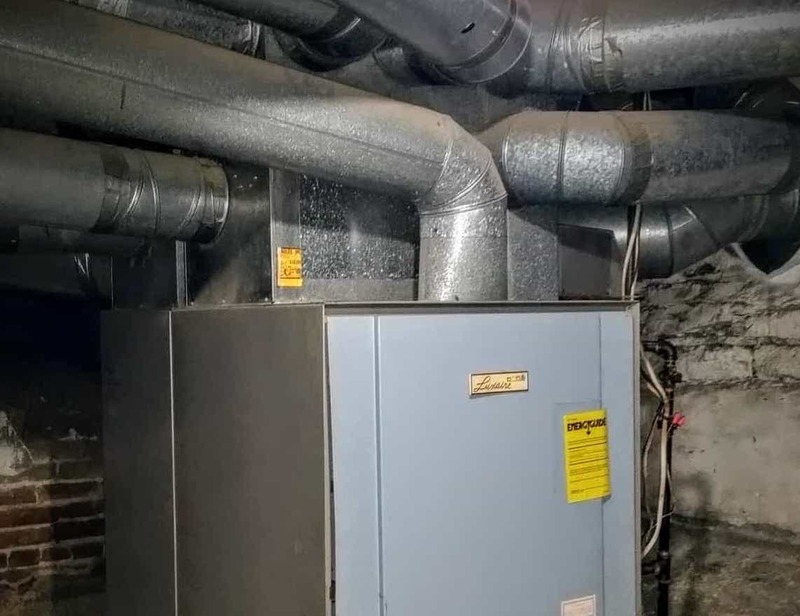 Planning and design – Comfort Advisor Scott Haring measured the old furnace and mapped the supply and return air ducts. Execution – Field Supervisor Vic finalized the design for the new insulated sheet metal ducts we fabricated in our sheet metal shop. 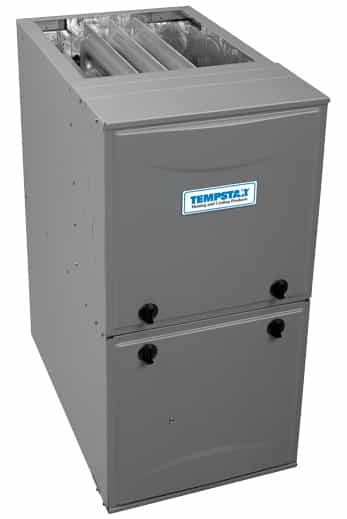 Most popular furnace – The Tempstar F9MVE gas furnace was selected for best fit and best value. Breathes easy – Two-pipe venting with PVC pipe draws combustion air from outdoors and exhausts through the basement wall. Thrifty gas consumption – The new furnace is two generations newer and rated 96% efficient. Thrifty electric consumption – The high-efficiency variable-speed ECM blower motor delivers proper airflow. Indoor Air Quality – A high-capture media air cleaner was installed that uses a common disposable 20 x 25 x 4” thick air filter. Future expansion – The house did not have central air conditioning; we incorporated a provision for an evaporator coil in the new ductwork. High and dry – The entire assembly was perched on risers to keep it off the floor in case of ground water intrusion. Remote drain – The condensate collects into a pump and is sent to a sanitary drain in the adjacent room. It was a big job, but our talented installers made sure it was done neatly. It looks and works great and will save energy. A future project may include a Mitsubishi Zoned Comfort System to serve the second floor, to manage the summertime cooling requirements. Is a solution like this right for your Heating & Cooling needs? To complete your heating and cooling system replacement call Scott Haring at (614) 552-4822 or contact me through our online form.